Contents of the Scroll of Antiochus. Name of a pseudepigraph, written in Hebrew, describing the revolt of the Maccabees, and depicting its glorious course. Saadia (892-942) was the first to make mention of this little book. He referred to it as "Ketab Bene Ḥashmonai" (translating doubtless the Hebrew "Sefer Bene Ḥashmonai"), and cited a verse from it (Harkavy, "Zikkaron la-Rishonim," v. 150, 180), which leaves no doubt concerning the identity of the Megillah with this "Book of the Hasmoneans." But the much-discussed "Scroll of the House of the Hasmoneans," which, it is alleged, the "Halakot Gedolot" quotes (middle of the eighth century), is purely imaginary; for not only does the manuscript read in this passage, "Megillat Ta'anit" ("Halakot Gedolot," ed. Hildesheimer, p. 615), but, even if the expression, "Megillat bet Ḥashmonai," of the printed text be adopted, the passage would then bear the very opposite meaning to the one that has been deduced from it since the time of Rapoport. The passage should be translated: "The oldest of the pupils of Shammai and Hillel wrote 'Megillat Bet Ḥashmonai.' But up to the present time nothing is known of the Megillah; and this state of incognizance will last until the priest shall appear with the Urim and Thummim." The last words of the passage originate in Neh. vii. 65, and leave no doubt concerning the obscure expression ; since the words of Nehemiah or the similar expression, "when Elijah shall appear," were used to express the idea that what has disappeared, or lies hidden, will some time make its reappearance (I Macc. iv. 46; Mek., Beshallaḥ, Wayassa', 5, ed. Weiss, p. 60). This view also nullifies all speculation that the Talmud and the Midrashim drew upon a "Book of the Hasmoneans." At any rate, it may be asserted that the Megillat Antiochus was written at a time when even the vaguest recollection of the Maccabeans had disappeared. An additional proof of the same fact is furnished by the language and subject-matter of the work itself. The scroll begins with a description of the greatness and power of Antiochus, who was mighty and victorious, and built Antioch, a city on the seacoast (a misunderstanding of Gen. R. xxiii., beginning). His general Bagras also founded a city beyond Antioch, and called it after himself. In the twenty-third year of his reign, Antiochus determined to begin the religious war against the Jews. To that end he sent to Jerusalem his general Nicanor, who raged furiously against the pious Jews, and set up an idol in the Temple. When the high priest John, son of Mattathias, saw this, he appeared before Nicanor's house and demanded entrance. Admitted to Nicanor's presence, he declared himself willing to comply with the king's demand, and to offer a sacrifice to the idol. He expressed the wish, however, that all present should leave the house; since he feared that if the Jews heard of his deed he would be stoned. When left alone with Nicanor, John thrust into the general's heart the dagger that he had concealed under his garments. After this John waged a victorious war against the Greeks; and, as a memorial of his great deed, he erected a column with the inscription, "Maccabee, the Slayer of the Mighty." 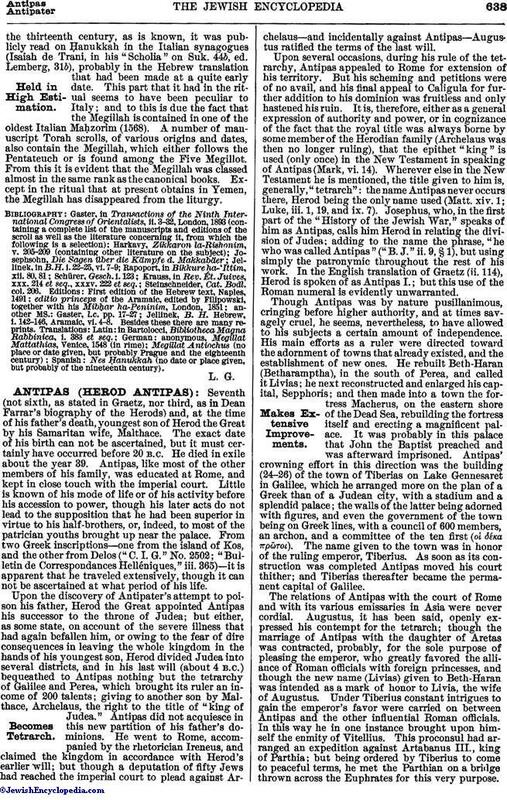 Antiochus now sent his general Bagris (a distorted form of the name Bacchides), who at first killed a number of Jews for observing their religious precepts; but he was at length compelled by the five sons of Mattathias to flee. He boarded a vessel, and set sail for Antioch. When, for the second time, he moved with a mighty host against the Jews, he was not much more successful. The five sons of Mattathias opposed him valiantly, and although Judas and Eleazar lost their lives, the Jews were triumphant. Their success was in no small measure due to the aged Mattathias, who, after the fall of Judas, himself undertook the guidance of the battle. This third battle was also the last; for Bagris was burned by the Jews, and Antiochus, after a revolt of his subjects, fled to Asia Minor and drowned himself. The Jews then purified the Temple. They were fortunate enough to find clean oil, which was needed for the holy lights, and although the quantity seemed sufficient for one day only, it lasted miraculously during eight days. For this reason the Maccabees instituted the eight-day Ḥanukkah feast. This outline of the subject-matter of the Scroll suffices to determine its historic value. That Antioch is mentioned as a coast city; that John, with the surname "Maccabee," is called a high priest; and that the reign of Antiochus is said to have lasted twenty-three years, all go to prove that the Megillah is a spurious work of fairly recent times. Since no Palestinian ever called Antioch a coast city, the statement concerning its position shows also that the work is a Babylonian product. The determination of the exact date of the Scroll is more difficult. If the above-mentioned passage in the "Halakot Gedolot" really refers to a "Book of the Hasmoneans," the only possible period could have been from the middle of the eighth to the middle of the ninth century; for, as has been said, the "Halakot Gedolot" does not presuppose a book that existed contemporaneously with itself. The sources drawn upon by the author of the Megillah were unhistoric, with the one exception of the First Book of the Maccabees (probably the Syriac version), of which passages were copied letter for letter (see "Megillat Antiochus," ed. Jellinek, verse 59; I Macc. iii. 46). 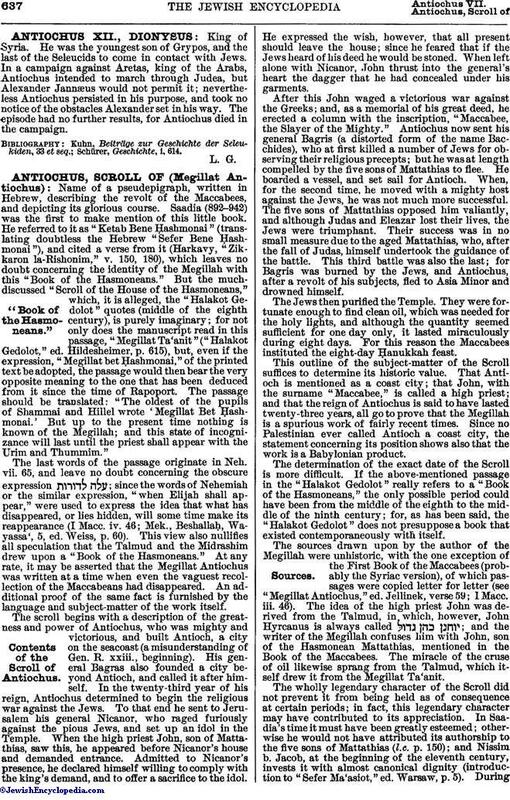 The idea of the high priest John was derived from the Talmud, in which, however, John Hyrcanus is always called ; and the writer of the Megillah confuses him with John, son of the Hasmonean Mattathias, mentioned in the Book of the Maccabees. The miracle of the cruse of oil likewise sprang from the Talmud, which itself drew it from the Megillat Ta'anit. The wholly legendary character of the Scroll did not prevent it from being held as of consequence at certain periods; in fact, this legendary character may have contributed to its appreciation. In Saadia's time it must have been greatly esteemed; otherwise he would not have attributed its authorship to the five sons of Mattathias (l.c. p. 150); and Nissim b. Jacob, at the beginning of the eleventh century, invests it with almost canonical dignity (introduction to "Sefer Ma'asiot," ed. Warsaw, p. 5). Duringthe thirteenth century, as is known, it was publicly read on Ḥanukkah in the Italian synagogues (Isaiah de Trani, in his "Scholia" on Suk. 44b, ed. Lemberg, 31b), probably in the Hebrew translation that had been made at a quite early date. This part that it had in the ritual seems to have been peculiar to Italy; and to this is due the fact that the Megillah is contained in one of the oldest Italian Maḥzorim (1568). A number of manuscript Torah scrolls, of various origins and dates, also contain the Megillah, which either follows the Pentateuch or is found among the Five Megillot. From this it is evident that the Megillah was classed almost in the same rank as the canonical books. Except in the ritual that at present obtains in Yemen, the Megillah has disappeared from the liturgy. Spanish: Nes Ḥanukkah (no date or place given, but probably of the nineteenth century).